The planet is being destroyed, we are creating an underclass, we’re exploiting poor people all over the world and the genuine, legitimate problems of the people are not being addressed by our political class. Russell Brand may or may not be a “very trivial man” but what he said was far from trivial. He called for a revolution because neither our politicians nor our political system are capable of addressing the most pressing issues of out time. Brand was not fomenting revolution, he was pointing to the conditions in which revolutions (sometimes bloody ones) occur and saying that revolution is inevitable unless they are addressed. Revolutions happen not when governments fail but when systems of government fail. Faced with the breathtaking arrogance and single-minded self-interest of the ruling socio-economic elite in this country and much of the world, it is pretty clear that we can’t vote ourselves out the mess we’re in. Well said Russell. Well done for standing up to Jeremy Paxman, someone I have long admired who should have known better (and I think did) and for naming some painful truths. Like the character played by Peter Finch in the 1976 film Network, more of us need to tell those who think themselves our masters that we’re mad as hell and we’re not going to take it any more. Scores of forest fires burned on the hillsides of Minho where we stayed this summer. 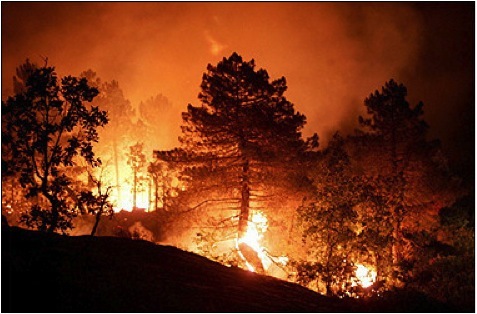 It seemed during August that the whole of Portugal was ablaze. In the daytime columns of smoke rose to the heavens and streaked the sky; at night the flames were visible from miles away. The landscape around our rented yurt was rugged and beautiful; rock pools for wild swimming and mountain trails to walk. The night sky – when free of smoke – was inky black and full of stars. But one night trouble came knocking at our door. As we lay in bed my partner was suddenly taken ill. I called for help and neighbours came running; they sent for an ambulance. The truth is that I’d grown used to protecting my heart from the possibility of love. But when mortality drew near I stepped into the flames, wanting to be consumed. All my familiar hesitations and fears melted away; my lame excuses for living alone vanished in a puff of smoke. And on the other side of that phoenix-fire, I have learned something that most people already seemed to know: although it isn’t easy, it is very simple to love someone. You just have to say “Yes” to them. But you have to mean it with every fibre of your body and every ounce of your being.